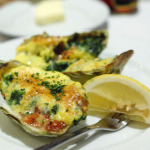 Oysters Rockafella: Oysters Rockefeller was created at the New Orleans restaurant Antoine’s which was founded in 1840 by Antoine Alciatore. The dish was created in 1899 by Antoines’ son, Jules Alciatore. 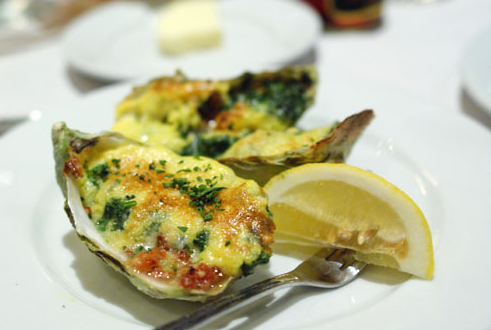 He developed Oysters Rockefeller due to a shortage of French snails, substituting them with locally available oysters. Antoine’s has been serving the original recipe dish since 1899. It is estimated that Antoine’s has served over three million, five hundred thousand orders! Because of the intense richness of the sauce, Oysters Rockafella is named after John D. Rockefeller, the richest American at the time. Though the original recipe is a secret, the sauce is known to be a purée of a number of green vegetables other than spinach. It consists of oysters on the half-shell topped with the sauce and bread crumbs and then baked. Put the oysters on a baking tray and place in a preheated oven at 180C 350F mark 4 for 1 – 2 minutes until they open. Remove the oysters from their shells, reserving the liquid. Clean out the empty shells. Place the white wine, carrot, celery, lemon juice and reserved oyster juice in a saucepan and cook for 5 minutes until the vegetables are tender and the stock is reduced. Return the oysters to their shells and place in a baking dish. In a bowl, whisk the cream and egg yolks together, then pour on the stock giving it a stir. Return to the pan and cook gently over a low heat, stirring constantly, until slightly thickened. Season with salt and pepper then pour the sauce evenly over the oysters. 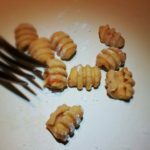 Divide the mozzarella and breadcrumbs among them and place under a preheated grill until the cheese melts and the breadcrumbs begins to brown. Serve 3 oysters per person. The best American peach jam by Vi!